Yes, thank you, I am getting my work done. I just had to do this first. Oh, that's wonderful! I hope you do make a spreadsheet with Jeannie. I love the way you make your sense of humor into pictures! Though, it's Gershwin. It's not like that's a bad thing! Maybe you should add an earworm disclaimer, though? i needed a chuckle.... thanks! Perhaps if this were a PowerPoint presentation? Franklin, you crack me up! You are a clever monkey! That is perfect. Things must be completed when their time comes. It makes perfect sense to me that you needed to complete that first. You make me laugh and laugh, Franklin. I put that one on my computer desktop. For accurate Broadway musical self-referentiality, the section marked "Ask for anything more" should have an arrow leading to "Oliver!" ("Please, sir, can I have some more?"). Yes, but do you have "Brian Wilson Reimagines Gershwin" blasting in your car? I do, for the past week and a half. S'Wonderful. I have had a rather long day - apparently what I needed was a Gershwin flow chart. How'd you know? The post is funny. The label on the post is HILARIOUS! I can't wait for that spreadsheet! I would so buy that on a mug.. hee-lar-i-ous, and yes, the song is now stuck in my head too..
Ha ha. I just sprayed my martini all over my keyboard (computer, not piano). Thanks for the giggle. Oh crap, I'm sitting here on 10th Avenue and this just slaughtered me. Now all we need is Porgy and Bess as a SharePoint site. It is all so clear now! I love!!! Thanks for the laugh this morning. LOL! I loved it. This only supports my previously unpublished request (demand?) that you blog more frequently! You say tomato ... do you know the story about that lyric when the sheet music was published in England? They just sang "tomato-tomato" - not to-mah-to ... until the American recordings came to England. Instead of Stephen Foster (I Dream of Jeannie) how about another Stephen -- as in Sondheim -- as I just got the cd of Sondheim on Sondheim, and it includes the autobiographical parts by Mr, Sondheim himself ... I mean, if you are looking for a distraction... the charting is bound to be more complicated for "Passion" or "Sunday in the Park" or "Road Show!" Thanks for the chuckles! Now I have Gershwin and Sondheim running through my head! I see in my mind gene kelly tappiing out this tune in "an american in paris". and it makes me smile. gershwin is my fave composer! You're doing a lovely job of getting your Graphjam on. Very nice. That belongs on a t-shirt! It's s'wonderful, s'marvelous!! Please chart more Gershwin lyrics - I never loved diagramming sentences and doing social work genograms. This is BETTER. Now, I've asked for anything (something?) more! Did you get new graphics software? I'm seeing a trend. Damn, sir, you are brilliant in oh so many ways. Will this be part of your next workshop presentation? I love it! Oh, that's awesome! You just made my morning (which had been pretty craptacular and was heading toward a first class pity party) about a million times better. Thanks for the laugh! This is TOO funny! I had to share it with my 70 yo Dad, who is a huge Gershwin fan. I grew up on this music. Thanks for the chuckle. Thank you, this definitely made me smile today! I hope you've sent this to the guys over at I Love Charts! Brilliant, sez I the process engineer. My muggle comic-lovin' husband enjoyed this one as well. We are polar opposite twins! I started sewing when I was a wee one and slowly worked my way up until suddenly sewing is my full time job. At some point in college while I was finishing my sewing homework I realized I had some free time, but I sure as heck was NOT going to go sew something. So now what? I bought the idiot's guide to knitting and got started. When I was eight, my aunt had taught me how to knit. It was amazing to feel the muscle memory kick in. So now I knit for fun and sew for money. I LOVE you shirt squares. So cool! Congratulations! 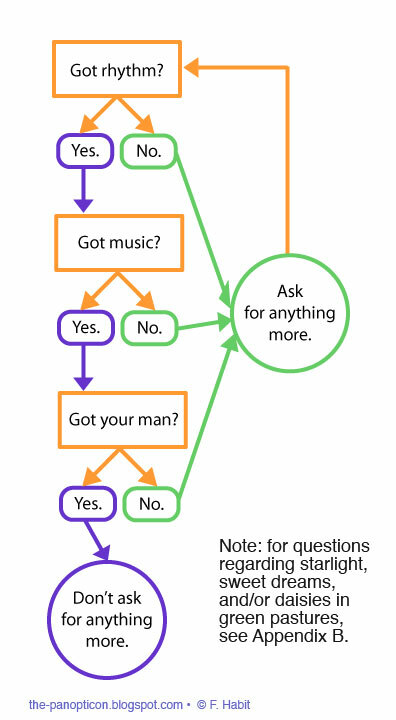 Favorite composer + favorite song + geeky flowchart = made of win. Love your blog! While the Louis Vuitton handbags line began to coat, great Balenciaga handbags patent raincoat and military inspection at the local Balenciaga handbags well-known for many Christian Dior handbags years led the dress, perfume Jimmy Choo handbags boxes, the current custom Miu Miu handbags handbags. Robert menchetti, who in 1999, the Italian Prada handbags custom over the shares in Hermes handbags market in the awesome progress. Victoria Beckham Miu Miu handbags style defined by the elite, in the direction of the British Goyard handbags royal family – from David Beckham Kate Winslet Prince William Fendi handbags– red carpet or not, Marc Jacobs handbags style arrival stood up, in your interpersonal circle.